There are now quite a few different power meters available on the market offering the same main feature – the ability to measure directly the power used by any electrical appliance plugged into the mains. See our articles Buy UK Power Meter, Kill a Watt, and EcoSavers Plug in Power Meter for more information on these products. Such commercial power meters are available relatively cheaply and they work well, but it is also perfectly possible to put together your own DIY power meter as a fun and educational project. EnerJar is a plug-in energy monitoring device which can be put together following a set of open-source schematics available online free of charge, and it was the Grand Prize winner of the Greener Gadgets design competition. 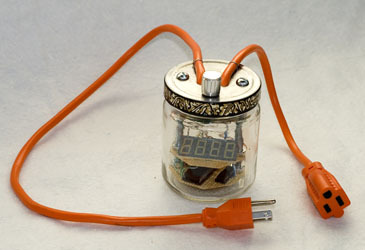 The EnerJar uses an LED display to show the current power level, and a PIC16F877a PIC microcontroller (see our article on PICAXE microcontrollers for information on the PICAXE system – an excellent introduction to PIC programming). The current (via 0.01R shunt resistor) and voltage (via a voltage divider) is measured, and then Ohm’s Law (power = current x voltage) is used to calculate the power and it is then displayed. The original EnerJar design is for use with US 120 VAC mains electricity, however it can be used with 240 VAC (UK mains) by changing the value of one resistor. The EnerJar design as it stands is not particularly safe since there is no isolation between the mains AC line and the low voltage circuitry. Using two power supplies, relays, hall effect sensors, and/or signal transformers resulted in increased complexity, cost, and a loss of sensitivity. For that reason, the designers of EnerJar (Matt Meshulam and Zach Dwiel) no longer support the EnerJar project, but they are interested to hear from anybody who can improve upon their design making it safe and still simple. For full details on EnerJar including full hardware schematics and software code, click here to visit the official EnerJar website. The hardware Schematic is here.